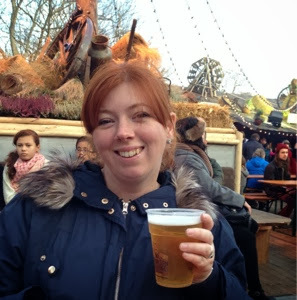 Although I have visited before, a trip to London in December is not complete without a visit to Hyde Park's Winter Wonderland. We didn't pre-book any attractions as just wanted the freedom to turn up and wander around when it suited us. 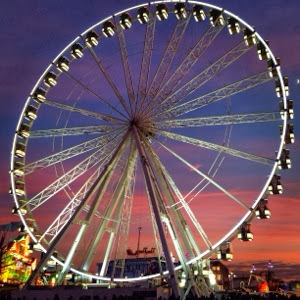 Last year I bought tickets for the big wheel. It was a lovely treat and I would certainly recommend. The views over London are amazing and Christmas songs are piped into your pod making the whole occasion feel very festive indeed. 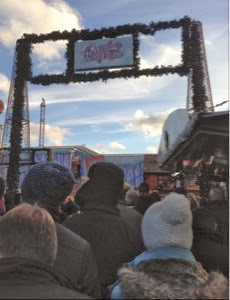 We arrived at Winter Wonderland at about 2:30pm on a Sunday afternoon. I had heard of large crowds at weekends and indeed it was very busy. They only had one entrance open and the queues were very long. We asked how long the wait was and were told it could be over an hour. We decided to chance it however and actually only ended up waiting for about 20minutes which wasn't bad. We were entertained by the staff's attempts at keeping the ever-complaining crowd in check. Winter Wonderland is free to enter. You can pre-book for attractions such as Zippo's circus and ice-skating (some tickets may be available on the day but they were sold out on the day of our visit). You can also buy ride tokens for the many 'Christmas themed' fairground rides once inside. The queues for rides didn't seem too long and children and grown ups seemed to enjoy them. The Santa train that travels around the whole of Winter Wonderland seemed popular as did the white knuckle rides for those that were brave enough. Inside it was very busy but the crowds were well controlled with Marshall's directing everybody and plenty of signposts and maps to help you find your way. I had previously heard complaints that it was very difficult with a pushchair however it seemed completely fine to me and I would say you were ok to bring one (as many people had). The crowds were a lot easier to navigate than the Southbank crowds we experienced on Saturday night. 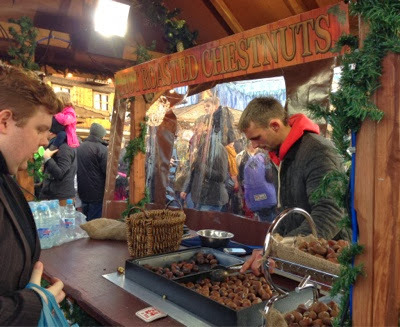 Our first stop was the roast chestnut stall. At £4 for a small bag we didn't find this was too expensive for a central London attraction. 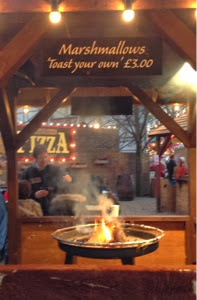 Then we found ourself in the market area of Winter Wonderland and enjoyed browsing the stalls. The personalised gingerbread hearts were lovely and would make a great gift. I would have bought one for our children if I hadn't have been worried about them breaking on the trip home. I did end up buying a handprinted glass Christmas tealight holder. I thought £10 was an OK price. I did hear a few people saying they were too expensive though. 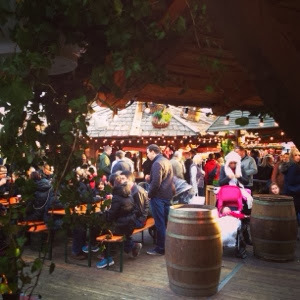 Next we found ourselves in the Bavarian village which is a large beer garden made up of wooden benches and fire pits which is surrounded by wooden huts selling German beers, mulled wine and cider's. You could buy Giant 1 litre glasses filled with German beer for £9. We opted for a regular pint though and thoroughly enjoyed it. There was a live singer on the stage in the beer garden encouraging everybody to join in some festive sing-a-longs. Everybody was joining in and in such high spirits. The atmosphere was wonderful. It was safe enough for children too (not too many drunks around at this time of day). When we finished our beer's we were off in search of some food. There is a lot of choice and we were tempted by the German sausage stall which smelled amazing! 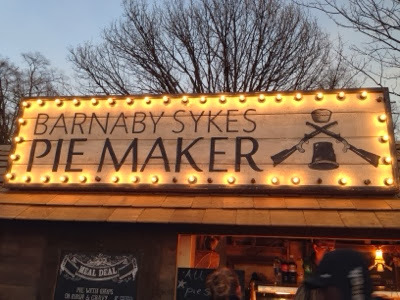 The hog roast and crackling was also a close competitor, We finally decided on a handmade pie and chips. I opted for lamb and mint whilst hubby chose steak and ale. 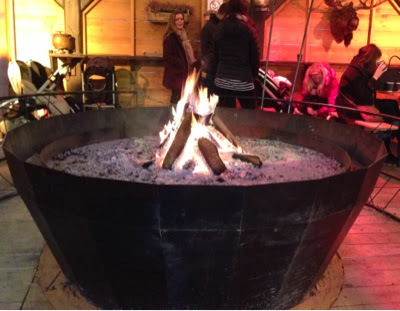 We enjoyed them in the firepit area of Winter Wonderland which was lovely and warm. You could also toast your own marshmallows over the fire. 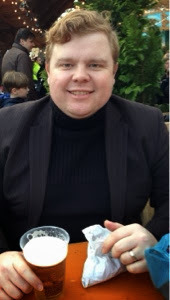 Our pies were full of flavour and contained so much filling that I couldn't finish mine. Certainly worth £5.50. 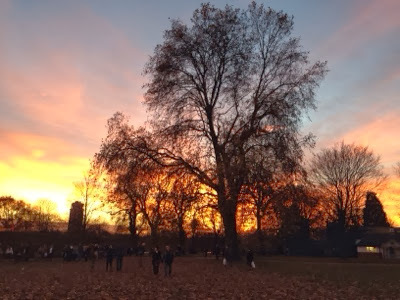 It was lovely to finish our visit with a final walk around Winter Wonderland as the sun was starting to set. It looked very pretty all lit up at night and somehow they even manage to make it snow! Very Christmassy. The ice skating and carousel bar looked lovely so definitely something to try next time. 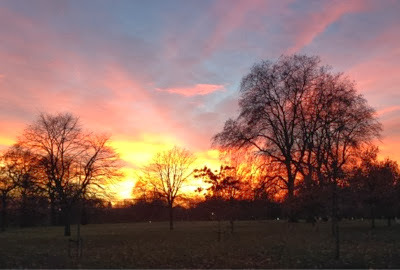 We walked home through Hyde Park as the sun was setting and the views were simply stunning. 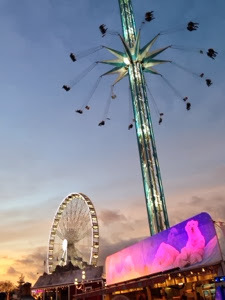 Winter Wonderland is definitely an attraction to visit if you are young or old. Don't let the crowds put you off! Argh... we're planning to go in December! I've been loads of times with friends - in fact, last time I was there I was convinced I was pregnant even though the test had said no, I was right! Can't wait to take Sprog along this year! Festive fayre at The Three Horseshoes, Horton.